We have a mixed flock of laying chickens that include Americaunas, Speckled Sussex, Black Australorp, Rhode Island Reds, Buff Orpingtons, Golden Brabanters and Barnvelders. Our chickens are a little less free range than in past years, thanks to a hungry local fox! They still range outside everyday, and they are locked up at night for safe keeping! 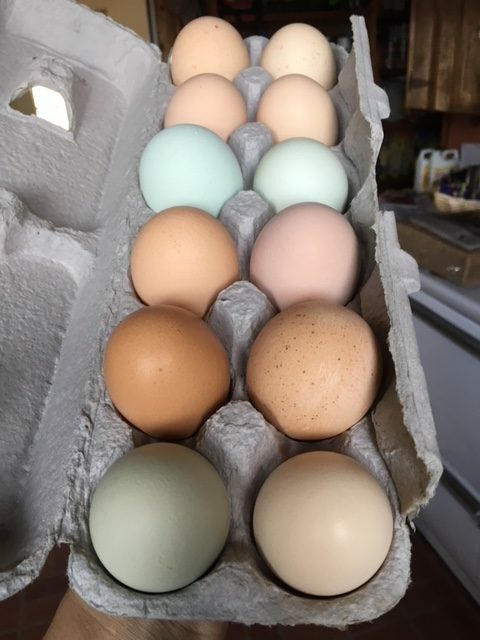 Eggs come in all sizes and colors from white and brown eggs to blue and green! Fresh eggs are available daily self serve. Contact us to find out how to access the self serve eggs.